"The quality of education provided in this school is outstanding." This section of our website will follow shortly. Click here to view our Pastoral House System. Click here to view our Media Gallery. Almost 80 pupils from St. Mary’s Grammar School, Magherafelt have been presented with a faith award by Archbishop Eamon Martin in St. Patrick’s Cathedral, Armagh. The Pope John Paul II Award and the Muiredach Cross Award were presented to the young people at a special ceremony on Thursday 28 March 2019 in recognition of their volunteering work in parishes, communities and schools. A Year 13 student from St. Mary’s Grammar School, Magherafelt has won the top prize in this year’s Michaela Foundation Wings Award Programme. Students from St. Mary’s Grammar School, Magherafelt have had the opportunity to speak to Lord Kerr as part of the Supreme Court’s Ask a Justice initiative. The programme provides young people with a keen interest in law with the chance to engage in a live question and answer session with a Justice from within the comfort of their own school. ​The Governors, Principal, staff and pupils of St. Mary’s Grammar School extend their sincere sympathy and prayers to the families, friends and communities of those who lost loved ones following the tragedy in Cookstown on St. Patrick’s day. Our Lady of Sorrows pray for them. Miss McCloskey (Head of Chemistry) pictured with participants in the recent UK Chemistry Olympiad competition. Pupils Barry McErlean, Ella McKenna, Ciara Cassidy, Conor Bradley & John McMorrow (missing from picture) displayed a wide and diverse range of chemical knowledge and expertise to answer some very challenging questions - well beyond the scope of the Chemistry studied in the classroom. Congratulation in particular to Barry McErlean who achieved a prestigious Gold Award. Two young students from St. Mary’s Grammar School, Magherafelt have launched an innovative new “CropSafe” app that could help fight crop disease around the world. The new Chair of the Board of Governors of St. Mary’s Grammar School, Magherafelt has been introduced to the staff of the school. Mrs Anne-Marie Campbell (née Pimley) addressed teaching and teaching support staff to outline the Governors’ vision for the continued success and development of the school in the years ahead. As part of the Senior School General RE provision, speakers are organised for Year 14 students throughout the year. Recently, the pupils were brought on a virtual tour of the Holy Land by Mr. A. Thomson. St. Mary’s is joining schools across the globe in celebrating Catholic Schools Week 2019 from 27 January to 3 February 2019. The theme of this year’s Catholic Schools Week is ‘Celebrating the Work of Our Local Catholic Schools’. This year, St. Mary’s launched the Trócaire Gifts of Love initiative. Staff and senior pupils responded with resounding generosity to the campaign by purchasing a range of global gifts. On sale were gifts of chicks, solar lamps, soap, school kits, goats, school lunches and bee hives. The money raised from the sale of these gifts will go to the developing world to improve the lives of those who live there. Funds generated through Gifts of Love will also fund critical work in Trócaire’s Justice, Resource Rights and Women’s Empowerment programmes. On Friday 30 November 2018, former St. Mary’s pupil, Sister Catherine Lavery, was installed as Provincial of the Holy Family of Bordeaux in Ireland and Britain. Sister Catherine was Head Girl of St. Mary’s in her final year, having attended the school from 1978 - 1986. She trained in St. Mary’s, Belfast and taught for a number of years prior to taking her Holy Order. Congratulations to Terry Devlin (11E) who was selected to play soccer for the Northern Ireland Under 16 International Team in Poland. Terry travelled with the squad to Poland on 25 November 2018 for five days, during which time he played in two international games against Poland. On Thursday 25 October 2018, students from St. Mary’s Grammar School went to the polls to vote for the pupils they wanted to elect as members of the school’s Student Council. Working together, the Student Leadership Team planned and organised the event. On Wednesday 24 October 2018, former St. Mary’s pupil, Ciara Hampsey, visited the Art and Design Department to deliver a Halloween special effects make-up workshop. St. Mary’s Grammar School once again took part in the annual Road of Hope Shoe Box Appeal. Road of Hope is a voluntary charity organisation that relies on the goodwill of local people to help support those underprivileged in countries such as Bosnia, Croatia, Romania and Africa. On Monday 22 October 2018, St. Mary’s was delighted to welcome Mr Billy Brown and Mr Ray Stewart, representatives of Gideons International, to speak to Year Eight during their weekly assembly. Students learnt about the work of the Gideons before receiving their own copy of the Bible. Many thanks to Mr Brown and Mr Stewart for taking the time to visit the school and to Gideons International for providing a bible for each pupil to keep. On Saturday 20 October 2018, musicians from St. Mary’s Grammar School’s traditional group - Cumann Ceoil Naomh Mhuire - held a morning of music in Meadowlane Shopping Centre, Magherafelt to raise funds for their trip to London to play at the School Proms. On Friday 19 October 2018, GCSE and A Level Art and Design students, accompanied by Mrs McKernan, Mrs Patton, Miss Kerr and Mr Carleton, travelled to Dublin to visit three art galleries and museums. The main purpose of the visit was to observe the work of historical and contemporary practitioners to enable pupils to develop their practical and written work. On Tuesday 16 October 2018, the Drama Department of St. Mary’s Grammar School was pleased to welcome c21 Theatre Company to the school. As part of its Irish tour, and ahead of its run in The Mac Theatre, Belfast, the company brought its current production of It Only Takes a Minute to St. Mary’s. The play was performed for Year 10 pupils and GCSE and A Level Drama and Theatre Studies students. As part of the Muiredach Cross and John Paul II Awards, nine pupils from St. Mary’s Grammar School gave up their Saturday morning on 29 September 2018 to lend a hand at New Row Primary School, Castledawson. Action MS Chief Executive, Mrs Ann Walker, visited St. Mary’s Grammar School this week for a special Awards Presentation to thank Year 10 pupils for their tremendous efforts on behalf of people with multiple sclerosis. Organised by Mr Brady (Head of Year 10), pupils took part in a Walk for MS in June at Meadowbank Sports Arena and raised a total of £2,346.98 in aid of Action MS, Northern Ireland’s Multiple Sclerosis Charity. On Thursday 13 September 2018, St. Mary’s Grammar School held its Annual Awards Ceremony to acknowledge the achievements and successes of pupils throughout the last academic year. The theme for the evening was: “Sharing Vision, Sharing Effort, Sharing Success”. The Principal of St. Mary’s Grammar School, Magherafelt has described this year’s GCSE examination results as “outstanding”. A Level students in St. Mary’s Grammar School had cause for celebration following the publication of this year’s examination results. Ms Gillespie, Principal, reported that an outstanding 95% of all examinations taken by students resulted in A*-C grades. 81% of all entries resulted in A*-B grades while 44% of all entries resulted in A*-A grades. A team of Year 9 and Year 10 pupils from St. Mary’s Grammar School, Magherafelt recently participated in the UK Final of the National Magistrates’ Court Mock Trial, organised by the Citizenship Foundation, and hosted in Birmingham’s Victoria Law Courts. A Year 13 student from St. Mary’s Grammar School, Magherafelt has been awarded a place on the Human Oncology and Pathogenesis Programme (HOPP) at Memorial Sloan Kettering Cancer Centre in New York. St. Mary’s Grammar invites P6 pupils to register for the 2018 Summer Camp. Following the passing of Mrs Hynds, Assistant Principal, a Book of Condolence will be open in the Main Reception area of St. Mary’s from Tuesday 17 April 2018 – Friday 27 April 2018 between 10am and 3pm each week day. Members of the St. Mary’s community, including past pupils, former colleagues, parents and friends of the school, who wish to remember Mrs Hynds are invited to visit St. Mary’s to sign the Book of Condolence. May she rest in peace. It is with deep regret and sadness that we learned today of the passing of our esteemed Assistant Principal, Mrs Irene Hynds (RIP). Please remember Mrs Hynds and her family in your prayers. Following the passing of Mrs Hynds, St. Mary’s will close all day on Wednesday 18 April 2018. Mrs Hynds’s Requiem Mass will be held in the Church of the Assumption, Magherafelt on Wednesday at 11am. Parents’ Information Event at Ulster University. Ulster University would like to invite parents and guardians of Year 12 and 13 students to their Parents’ Information Event. Students are welcome to attend. The Life Advocate Award Essay Competition is a prestigious award which receives a tremendous response from students all across Ireland. The annual essay-writing competition was set up to encourage research and critical thinking on right-to-life issues. ‘Guys and Dolls’ donation to Marie Curie Cancer Care. Heather Miller, Community Fundraiser for Marie Curie Cancer Care, accepts a cheque from pupils and staff in St. Mary’s Grammar School, Magherafelt. The money was raised through a raffle on the Gala Evening of the school’s production, Guys and Dolls. Included in the picture are: Mr G. Quinn (Senior Teacher), Miss U. Donnelly (Head of Music), Heather Miller (Marie Curie), Mr F. Dunlop (Vice-Principal), Tiarnach Donaghy, Odhran Lynch, Roise Pelan, Daniel McNamee, Anna McCloskey, Oisin Duffin and Adam Connolly. St. Mary’s Grammar School, Magherafelt hosted its annual Primary School Gaelic Football Tournament on Wednesday 28th February 2018 in Meadowbank Sports Arena. It was a bitterly cold and wintry day, but that did not stop 12 primary schools competing. ‘Mood Matters’ at St. Mary’s. Year 14 students were invited to attend a workshop, facilitated by Aware NI, on Mental Health Awareness. The workshop, entitled ‘Mood Matters’, aimed to give young people knowledge and skills which they can use to maintain good mental health and build resilience in order to better deal with problems and challenges. St. Mary’s pupils enjoyed success in the District C Cross Country event on Thursday 25 January 2018. The top 15 individuals and top 3 teams in each race qualified for the Ulster competition which takes place on 21 February 2018. Warm welcome at St. Mary’s Open Evenings. On Tuesday 23 and Wednesday 24 January 2018, St. Mary’s held its annual Open Evenings. We were excited to open our school to prospective pupils, their parents and the local community. The St. Mary’s team look forward to welcoming you to one of our Open Evenings next week. ​Due to adverse weather conditions and in the interest of safety for all, St. Mary’s will be closed today - 17 January. Three free sessions of SEN Training, provided by Empower will take place in St Mary’s in the upcoming weeks. On Friday 17 December 2017, Year 12 pupil, Mark Comer, visited BBC Headquarters in Belfast to complete his participation in BBC Radio 4’s Pen Pals programme. In October, former pupil of St. Mary’s, Ciara Hampsey, visited the Art Department to deliver a Halloween special effects make-up workshop. More than 60 pupils from Year 10 - Year 14 enthusiastically took part in the exciting event which included a demonstration by Ciara as well as the opportunity to experiment with the shocking special effects techniques themselves. Universities from throughout Ireland and England attended a University Roadshow organised by Head of Careers, Miss Donoghue. 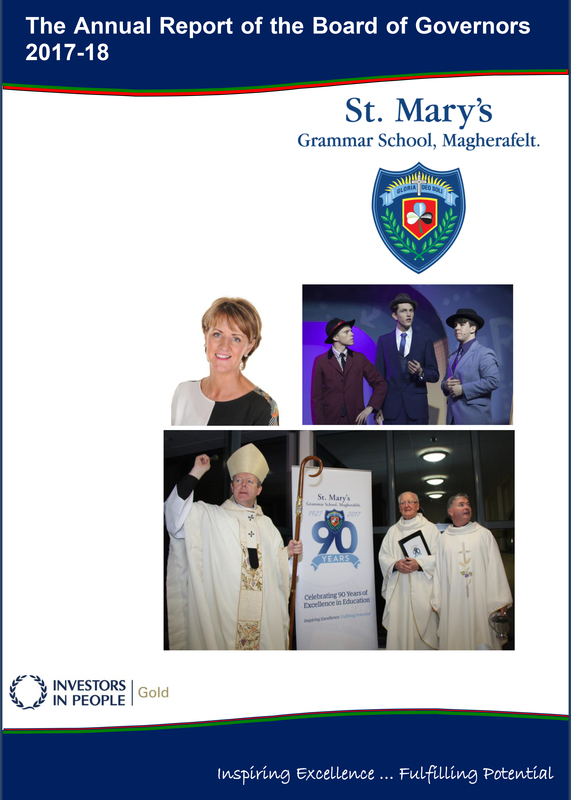 In its 90th anniversary year, St. Mary’s Grammar School, Magherafelt is proud to present the musical comedy, Guys and Dolls. ​School closed tomorrow (Tuesday 17 October) as precautionary measure in light of weather warnings. On 26th September A Level and GCSE Drama pupils took a trip to the MAC theatre Belfast to see a production of The Secret Diary of Adrian Mole. We are delighted that Liverpool University will be here on Monday 16 October delivering a talk about their University. Liverpool is a very popular university choice with our students particularly those hoping to study Medicine, Dentistry, Veterinary and the Health Therapies. Y14 students who have applied to Liverpool and any Y13 & Y12 students who are considering Medicine, Dentistry, Veterinary/ health therapies as a possibility next year should come along as this is their opportunity to ask directly about the interview process, how UKCAT is used, what work experience they expect and the GCSE/AS profile they require. Social Work Information Evening Wednesday 15 November 2017, 6.30pm-8.00pm. Whitla Hall, Queen’s University. The Children’s Texaco Art Competition has an annual entry of up to 50,000+ entries throughout Ireland each year. Blanche Cases, Year 9, has been awarded a ‘Highly Commended’ Certificate which means she has been placed in the top 18 in each category for her artistic entry. The judges of the competition commented on the exceptional standard of this year’s entries in each age category and we are so proud of Blanche for rising to the top as one of the best entries. For this we would warmly congratulate her on this truly superb achievement. Well done, Blanche. Celebrating the successes and achievements of the academic year 2016-17, the annual awards took place in the school on Tuesday 12 September. As well as celebrating the outstanding attainment of pupils in recent GCSE and A Level examinations, the evening also provided an opportunity to recognise the accomplishments of pupils in a range of extra-curricular activities, ranging from sport to public speaking. Year 13 prefects received professional training with Brian Moore, Geraldine Stinton and Lydia Startin from Belfast YMCA. The training was interactive, informative and it introduced the prefects to the idea of ‘coaching’. A Level students in St Mary’s Grammar School had cause for celebration following the publication of this year’s examination results. Ms Gillespie reported that an outstanding 95.2% of all examinations taken by students resulted in A* to C grades. 43% of all results were an A or A*. ​On Friday 9th June more than 100 inspirational students, teachers and Athlete Mentors attended the Sky Sports Living for Sport Awards at Twickenham. The day was held at the home of rugby, where Sky Sports Pundit and World Champion boxer, Johnny Nelson kicked off the day’s events and led a full day of activities and celebrations alongside twenty amazing Athlete Mentors. Year 12 student Catriona McCoy, has been awarded second place in a national essay-writing competition for senior cycle students. The Life Advocate Awards were set up to encourage research and critical-thinking on human rights and right to life issues. Students were asked to discuss the words of Martin Luther King who said: ‘Our lives begin to end, the moment we become silent about the things which matter’. St. Mary’s Grammar School, Magherafelt, flying the flag for the Irish language! The Gaelbhratach has finally arrived in St. Mary’s! St. Mary’s Grammar students received the prestigious Purple Flag award at a ceremony held in Leopardstown recently. The Gaelbhratach is awarded to schools who not only incorporate the Irish Language into the school community in a planned, structured and fun way but also those who carry this through outside of the classroom. Click here to be taken to the Parents' Area of our website. Click here to be taken to the Alumni Area of our website. Click here to be taken to the Pupils' Area of our website.